Win a It’s fun to be One Birthday Gift for Boys from Jewels and Pinstripes | Unique Mommy and Baby Clothes at Tuni & G.
Now your newborn toddler can enjoy the goodies from the It’s Fun to Be One Celebrity Boy Bag from Jewels and Pinstripes who’s giving one away. Included in the birthday gift bag is our very own "Text me…4 a PLAYDATE:)" ™ t-shirt and $50 gift certificate. A similar gift bag will be auctioned online at www.charityfolks.com with the proceeds going to the Moment by Moment Foundation. Click here to enter to win this fabulous birthday gift bag! 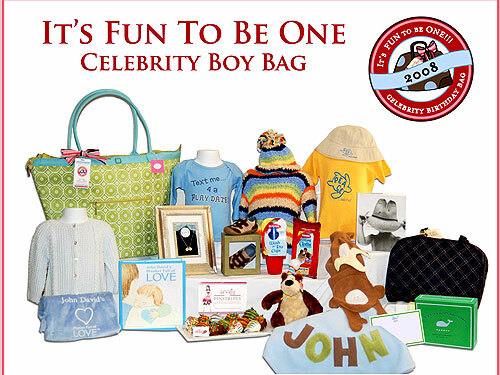 SOURCE: Win Jewels and Pinstripes’ It’s Fun to Be One Birthday Gift for Boys, a $1000 value!